It looks like the sun is going to be with us for a while to come and we here at Wexford Skin Clinic are obsessed with our SPF (Sun Protective Factor)…you’d never guess given the fact that we have 15 different types of SPF on our shelves and that’s not even including our make-up SPFs!! It makes my little heart sing at the moment with all the clients coming in telling me how conscious they are this year of being sun-safe… not just with their SPF but also their plastic-rimmed sunglasses, wide-rimmed hats and oodles of anti-oxidants, both topically and internally. So let’s educate ourselves on the sun rays and SPFs…. We’ve seen a few lobsters walking around lately and whilst the sunburn will disappear after a few days, the long term effects account for 90% of skin ageing!! UVB rays damage the skins more superficial layers thereby causing sunburn and tan. 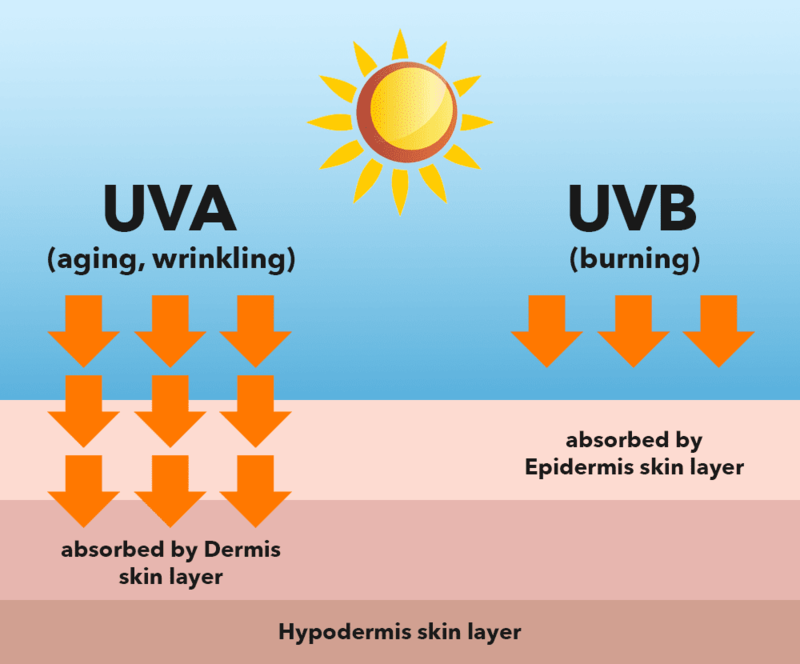 UVB plays a big part in the development of skin cancer. The scary thing about UVA rays is that they have no warning signs e.g. heat (however if there’s daylight, there’s sunlight) and they can penetrate through glass so think of being in your car or sitting beside a window in work. UVA rays penetrate into the deeper layers of the skin damaging collagen, elastin and blood vessels and given that most skin cancers originate in the basal layer of the skin it’s paramount that we protect against UVA. When looking for an SPF for your skin most people are just concerned with the number e.g. SPF50. This number is indicative of how much protection you have against UVB. So, for example, if WITHOUT sunscreen you would normally burn after 10 mins an SPF15 will allow you to stay in the sun for 15 times longer i.e. 150 minutes. BUT while it protects against burning, it’s not protective against skin ageing and skin cancer… in fact, the higher the SPF, the more damage you could be causing as it leads you to believe you can sit in the sun for longer!! The most important words to look for on your SPF are Broad Spectrum which means it protects you against UVB and UVA rays. In clinic, we also promote the use of low-chemical or physical-only SPFs. A physical SPF will reflect UV rays away from the skin whereas a chemical SPF will absorb and shatter UV rays within the skin. Physical SPFs will contain Zinc Oxide or Titanium Dioxide as their mineral sunscreen and these are the SPFs you should look for. The other important ingredients in an SPF are anti-oxidants. Sunscreens do not protect 100% from free-radicals so anti-oxidants are vital in and beneath your SPF to neutralise damage. Also feeding the skin from the inside with anti-oxidants such as broccoli for its Vitamin C, tomatoes for their Lycopene, salmon/trout for their Astaxanthin and red grapes (and red wine ) for Resveratrol! If you’re a client in our clinic, you’ll know there’s no such thing as a healthy tan. A tan is the skins response in trying to protect the cells DNA… so reach for the fake stuff!! If you would like any advise on SPFs, anti-oxidants or sun-safety, please just ask us. Ireland is the 14th most susceptible nation in the world for skin cancer with 16% of those diagnosed dying, so please enjoy the sun respectfully.